Sometimes, people leave in the middle of a conversation you're having with them in Drift. They've got to run to a meeting, they get distracted, or they lose connectivity. Don't worry! If you've captured their email address, your unread messages can still reach them by email so that they can continue the conversation when it's convenient for them! The email fallback setting is available on all Drift plans. You can turn this setting on by going to Settings > App Settings > Drift Widget > Advanced or click here! Simply switch the toggle to enable the feature! Unread messages will send via email after 15 minutes. Within the conversation view, we’ll give you a heads up that the conversation was sent via email. 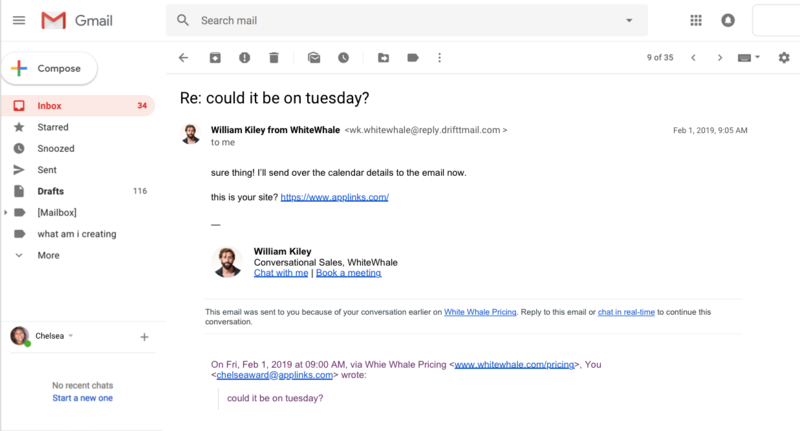 Fallback emails appear like a typical email thread, so you can intuitively continue the conversation by replying to the email. We also include hyperlinks to take you back to the page you were chatting on! If you have any questions, chat in and let us know!